Three candidates are listed on the November ballot for the statewide post that will oversee elections for the next four years. Current Secretary of State Paul Pate is seeking reelection. Pate, a Republican, served as secretary of state for one term in the 1990s, then won another term in the office four years ago. Pate is emphasizing his role in shaping the new state law that requires new measures to verify the identity of voters. Deidre DeJear is the Democratic candidate for secretary of state. DeJear said Pate’s office hasn’t done enough to explain the “soft roll out” of the new law and it risks disenfranchising qualified voters. “I want to be the one that’s a champion for people’s voices and a champion for people’s votes and ensuring we’re getting as many eligible voters out there participating in the process,” DeJear said on IPTV’s “Iowa Press” program. DeJear was a voter outreach coordinator for President Obama’s 2012 Iowa campaign. She’s now a consultant to small businesses and non-profits. This is her first run for elected office. 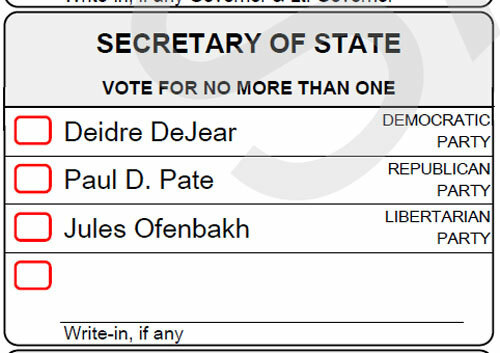 If DeJear wins this race, she would be the first black Iowan elected to statewide office. 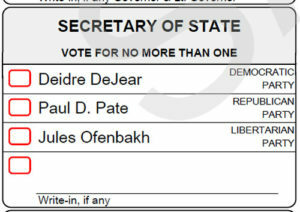 The Libertarian Party’s nominee for Secretary of State is Jules Ofenbakh, an attorney from West Des Moines who’s a native of Russia. “The fact that Iowans have their constitutional right impeded upon by a voter ID is appalling to me,” she said in August on the Des Moines Register’s Political Soapbox at the State Fair. Ofenbakh’s family came to the United States 26 years ago as visitors and sought political asylum. She became an American citizen 16 years later.